What would you say about a new hotel that has already hosted several large groups, accumulated an impressive guest list and has already received repeat business – while still weeks away from its April 15 grand opening? That’s what’s happening at Holiday Inn Fort Myers Airport@Town Center, at 9931 Interstate Commerce Drive in Fort Myers, which is exceeding expectations in the first month of operations – in spite of the economy. Managing Director Brian Holly is modest about the hotel’s initial success. Just a day and a half after opening, the hotel received a call looking for rooms for a government group – 123 rooms, to be exact, that were quickly booked for five nights. That group was President Obama’s Advance Team, and it included security, Secret Service and a communications team from the White House, ahead of the president’s Town Hall meeting at the Harborside Event Center. Holly said it was a great start for the first week in business. “It really got us off and running much quicker than we anticipated,” he said. 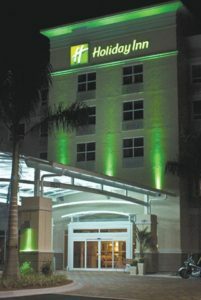 The Holiday Inn also received unexpected business from distressed passengers from Southwest Florida International Airport due to both weather and mechanical troubles. Holly says their sales team has lined up agreements with the airlines to funnel stranded air travelers to the hotel. An agreement has also been established for crew members laying over in Southwest Florida. The Holiday Inn also welcomed several sports teams that were in town for a baseball tournament at FGCU, as well as several softball teams. We are building the business. We have a great offer and a great product. While that extra business was not anticipated, it is in line with the game plan for the hotel. Owners and managers are hoping to capitalize on its location near the airport and FGCU to attract teams, travelers and business groups. It is that distinction in target clientele that Holly says is sparing the hotel from the economic crisis plaguing so many in the various hospitality industries across the region. According to Holly, the Holiday Inn Fort Myers Airport@Town Center provides options for people accustomed to a certain level of service but are now forced to re-evaluate their budget. “When you talk to the owner, he’ll tell you he has nerves about opening in this economy,” Holly said. “But from the operator’s standpoint, I think the hotel is positioned nicely. Hirschovits acknowledged the market is a concern, but said their formula works. The Holiday Inn is, in a sense, a hybrid between luxury and what is affordable right now. The hotel’s trade is expected to be comprised of about 60 percent group and 40 percent social reservations. Holly says it is all about filling a niche market. “Call me crazy, but that is why I am optimistic,” he said. The strategy is clearly working. With just one month under its belt, the hotel is already experiencing repeat business. Holly says it all started with the stranded passengers from the airport. Hirschovits said the staff reports a high level of guest and visitor satisfaction. The great product Hirschovits is referring to is a “Prototype Holiday Inn” – of which only a handful are open across the country. The design comes from a new European formula that, among other upgrades, has replaced the front reservation desk with podiums. The podiums are designed to put friendliness at the forefront of service. Hirschovits says they also took special steps to ensure they hired a superior staff. Aside from a great staff and a continental floor plan, the hotel has several upscale amenities that will also appeal to people living in Southwest Florida. The hotel has an indoor/outdoor lounge area called Oasis by The Lake, which includes a fire pit. The restaurant’s head chef is from Sanibel Harbor Resort & Spa, and the entire south side of the hotel features a waterside view of Lake Alico. Appearances aside, a busy opening month, an impressive guest list and repeat business ahead of the official grand opening are clear indications the Holiday Inn Fort Myers Airport@Town Center has indeed found the right market and location – even if it is miles from the beach.